My short story anthology britpulp! was first published by Sceptre in 1999, and is now being published as an ebook. The book features new and original stories from (in order of appearance) Michael Moorcock, Ted Lewis, Richard Allen, Victor Headley, Nicholas Blincoe, Catherine Johnson, Roy A. Bayfield, Steve Aylett, Stella Duffy, Simon Lewis, J.J. Connolly, Jane Graham, Karline Smith, Tim Etchells, Stewart Home, Jenny Valentish (née Knight), Billy Childish, Darren Francis, China Miéville, Steve Beard and Jack Trevor Story. It is particularly pleasing that Sceptre are releasing the first ebook edition of britpulp! at a time — fifteen years later — when according to Neilsen Book Scan’s annual book research for 2014, short stories and fiction anthologies are (along with Westerns and all graphic novels) one of the three categories in adult fiction publishing to see growth in the last year. britpulp! is urban, nervy, agressive. Fast-twitch prose that fizzes and spits. Narrative with a kick. Jump-cuts that hurt like a knuckle in the eye. Here are the improper (and therefore reliable) tales of the city — most of them Hackney. Here are stars who glory in their anonymity. Here too, in Michael Moorcock, Ted Lewis and Jack Trevor Story, are the best of the reforgotten (they’ve never gone away, although it has taken someone with Tony White’s sharp eye for history to acknowledge a proper debt). Pulp has always been a secret. Read by millions, remembered by few. There is no room for prima donnas in a world where gaudy-covered shockers have the lifespan of a fruitfly. There is only one rule: keep the pages turning. Get your retaliation in early, and often. Let this book read you. A generation of writers emerged in the 1990s who were publishing novels and short stories that seemed to draw upon the energies and forms of popular and genre fictions of the 1960s and ’70s, and declaring an interest, one way or another, in pulp. The resurgence of interest in the UK pulp fiction of that period had been bubbling under in the gaps between literature and the art world, in the spoken word scene, music and the style press, for a decade or more, but it was publication in the early 1990s of groundbreaking novels such as Victor Headley’s Yardie (X-Press, 1992), and Stewart Home’s Defiant Pose (Peter Owen, 1991), that brought the conversation back full circle to literature. Both authors were responding to, but also radically subverting the 1970s skinhead novels of Richard Allen, a pseudonym of Canadian expat author James Moffat (1922-1994). This was all coming closer to my home, too. X-Press were based around the corner from where I lived in Hackney, while Stewart Home’s third novel, Red London (AK Press, 1994) was set just down the road in Mile End. Who would have guessed that Richard Allen’s range of ’70s bootboy novels would have proved so influential? First Stewart Home samples the speed and aggression in order to turn round the political message and make the link with Burroughs and Blake; then Victor Headley steals a few riffs to draw up a map of the Black Atlantic in London. […] what subculture could be appropriated next? Tony White’s Road Rage makes it clear. Mixing psycho-social realism and techno-pagan fantasy, Tony White stakes out a position between Stewart Home and Martin Millar to offer a vision of London which is romantic, revolutionary and conservative all at the same time. […] a signpost to the fantastic worlds of a Michael Moorcock or an Alan Garner. I wasn’t alone in wanting to join this conversation. Headley and Home’s novels were quickly joined by many others: Nicholas Blincoe’s Acid Casuals (Serpent’s Tail, 1995), Karline Smith’s Moss Side Massive (X-Press, 1995), Stella Duffy’s ‘Saz’ novels, such as Wavewalker (Serpent’s Tail, 1996), the hardboiled and surreally comic routines of Steve Aylett’s The Crime Studio (Serif, 1994) — and many more. With britpulp! I decided to try and bring these writers — both established and newly emerging — together with the authors whose work in the 1960s and ’70s had influenced them, with rare, or never-before-published material from Michael Moorcock and late greats such as Jack Trevor Story, Richard Allen, and Ted Lewis. Working across literary generations meant that britpulp! hinged on the cooperation of various rights holders, but with only a few exceptions, everyone (and their estates) that I invited to contribute responded immediately and positively. Billy Childish, Jane Graham and Jenny Knight all said yes. Stewart Home offered a fantastic unpublished novella, while Mike Moorcock showed me the never-before-published last words of the legendary Jack Trevor Story, with their tragic final twist (a heartbreaking, handwritten note that is reproduced on the last page of the book). I wrote to Victor Headley about britpulp!, and his fellow X-Press author Karline Smith who both — to my delight — agreed to contribute. I also dropped a line to X-Press author Donald Gorgon (author of the Headley-like Cop Killer) but I’m not sure if he ever really existed. Perhaps someone out there knows differently, but the minute I had posted my letter to ‘Mr. Gorgon’ I immediately kicked myself for not seeing through what suddenly seemed an obvious pseudonym. In those pre-email days, Victor Headley had to fax his stories to me by satellite phone from wherever in the world he was. Sitting there late at night watching this incredible material scrolling out of my machine inch by inch was just one of the exciting moments in the britpulp! editorial process, and in my view Off Duty (as it was finally called, from which his story in britpulp! is extracted) is Headley’s finest novel. Looking at the list of contributors now it is hard to believe that when I was compiling britpulp! some of the authors had yet to be published. Discussing the anthology over a game of pool with an editor at a book launch, I was told about someone who I absolutely had to get in touch with: ‘He’s just sold his first novel,’ I was told. ‘It’s a kind of drum ’n’ bass Pied Piper!’ I scribbled down the name and number and called the next day: China Miéville said he would be delighted to send a story. Revisiting the original author biographies, we decided to leave them in place in this new edition. There is a certain ‘time-capsule’ quality that is fascinating. However we did invite the living contributors that I was able to contact to send updated biographies, which are collected together in the end papers, so readers can catch up with the very many more books that have been published by these great authors, who I was so lucky to work with fifteen years ago. It is great, too, to see the films that have been made — and are still being slated — J.J. Connolly’s Layer Cake, Catherine Johnson’s script for Bullet Boy, Simon Lewis who had three feature films released in 2014 including Jet Trash, based on his debut novel Go (Pulp Books 1998/Corgi 1999). Now Victor Headley’s Yardie is slated for feature production, with Idris Elba directing. Back in 1999, the author Syd Moore — who was then working at Random House — was fronting a books programme called ‘Pulped’ on Channel 4’s short-lived, late night cultural slot 4 Later. (Aside from noting the various contemporary uses of ‘pulp’ as a kind of standard, it is strange to remember how many books programmes were on TV at that time.) Pulped were keen to cover the anthology but we needed a location, and an angle. Walking down Brick Lane, I happened to bump into some hard-hatted official who was locking the enormous gates to the vast Victorian ruins of the former Bishopsgate Goodsyard, and managed to get us and the TV crew access to the incredible vaulted spaces beyond (which are mostly now demolished or under threat). The TV shoot and the setting provided the incentive to pull together a photo-shoot of as many of the living contributors as could be assembled in one place. Photographer Hugo Glendinning agreed to take the photos, including the stunning panoramic shot at the top of this piece. ‘It is not just Bishopsgate Goodsyard that has largely vanished. 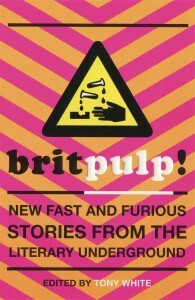 We launched the paperback of britpulp! in Brick Lane’s Vibe Bar which I was sad to hear had to close last year. But then I remembered what a great party we had there for the launch of this anthology, and the excitement of bringing together these writers from different generations for the first time. Something that is still well worth celebrating. I am delighted that Sceptre are publishing an ebook of britpulp! I hope you enjoy it. I was pretty new to London and to the London lit scene packed into this grab-bag (excepting Moorcock’s Cornelius and a Home or two) so I had this book with me for months, using it as a psychogeographical guide-book. The colours felt good. It disappeared into storage but I’m not sure which city so it’s good to have this permanently to hand now via my Twuntphone.